An unassuming one-room shoe factory in Bulawayo, Zimbabwe is quite literally defying the economic odds. Founded in 1994, the Courteney boot company has become a global niche brand in hand-made footwear. Despite a downward-spiralling Zimbabwean economy, the 14 staff at Courteney have their hands full to keep up with the increasing international demand. Remembering the safari of a lifetime should go beyond taking pictures and hunting game. In preparation, G&A believes that you should take gear that will enable a safe and successful adventure while embracing Africa’s romance. May we suggest starting at African Sporting Creations for unique, hand-made products that embody the ruggedness of Africa? Among the many items the company offers, there are four items we feel no hunter shouldn’t leave home without: shooting sticks, a good sling, an Arno Bernard knife and Courteney boots. Courteney boots come in various styles and are made from Nile crocodile, Cape buffalo, hippo, or ostrich leather. The most popular boot is the Selous, named after legendary explorer, conservationist, hunter and soldier Frederick Courteney Selous. These boots are constructed entirely from buffalo and impala, and hand stitched in Zimbabwe. The sole is made of a rubber “tyre” tread, and is highly regarded for producing little-to-no noise in the bush. One item African Sporting Creations is best known for are their shooting sticks. Made in-house of hickory, carbon fiber, or select, limited-edition African woods, the sticks feature leather-wrapped tops hand-sewn from buffalo or zebra leather. 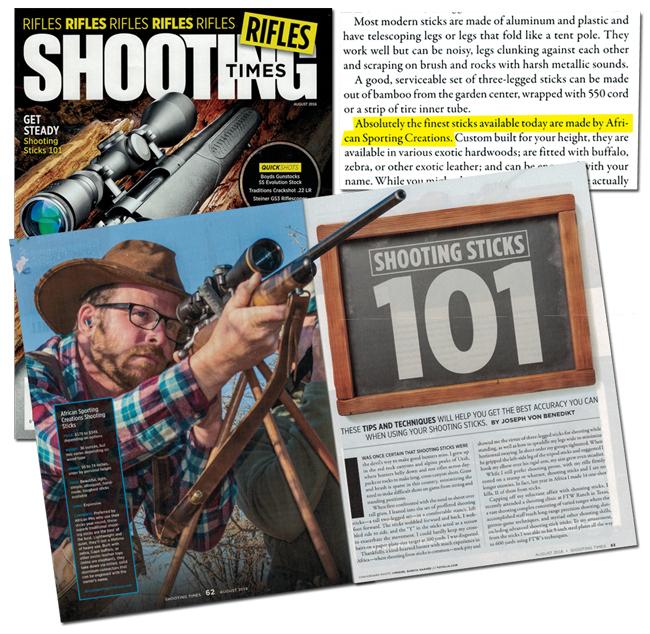 The leather improves grip while protecting the rifle’s forend when it’s time to shoot. Anodized aluminum connectors assemble quickly and the sticks can be stored for transport in a provided canvas carry case. No safari rifle is complete without a sling and no pair of binoculars should be either. The company offers a canvas and leather bino sling from Els & Co. The strap assembly is comfortable with three traditional brass studs that push into eyelets for adjusting to improve weight distribution. 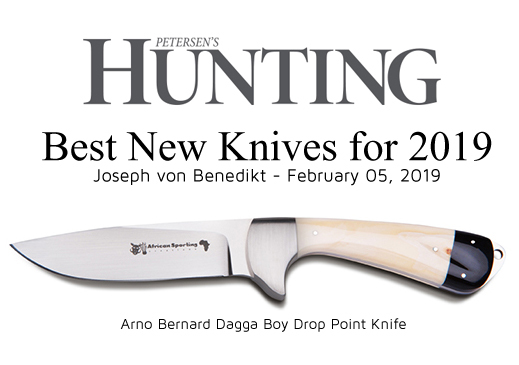 Knives are a collector’s favorite and African Sporting Creations is the U.S. master distributor for Arno Bernard knives featuring handles made of buffalo horn and warthog tusk. They also make great gifts to leave behind with your professional hunter or trackers who share your experience. Most of the products you’ll find at africansc.com are available nowhere else — just like your memories. "Absolutely the finest sticks available today are made by African Sporting Creations. Custom built for your height, they are available in various exotic hardwoods; are fitted with buffalo, zebra, or other exotic leather; and can be engraved with your name. While you might think they'd be heavy, they're actually lighter than competing metal and plastic versions, and they are far more durable. I've broken a few sets of modern sticks and have seen many more broken, but even African PHs, who work their shooting sticks incredibly hard year-round, don't wear out or break those made by African Sporting Creations." Shooting sticks have become standard tools for hunting in many places throughout the globe. A solid pair of sticks provides you with a steady platform from which to deliver an accurate first shot, regardless of the terrain. African Sporting Creations offers a line of handmade sticks designed to last forever and back up with an unconditional lifetime warranty. Shooting Sticks While most PHs have sticks for their clients, I'm 6-foot-4, and I don't shoot well bent over in a half-crouch. Jim Morando of African Sporting Creations makes beautifully crafted shooting sticks that are as rugged as they are refined. Threaded, two-piece aluminum connectors lock together to form three stable legs but permit easy takedown for travel. A host of custom options are available, including seven types of wood; leather, zebra or buffalo tops; engraving; and yes, different heights, too. A silent stalk never seems so critical as when closing inside 30 yards on elephant or buffalo. Designed by African PHs, the Hunter by Zimbabwe's Courteney Boot Company is a below-the-ankle boot that features a tough but thin ripple sole that makes it easy to avoid scuffling in rocks and gives the hunter greater feel for twigs that could betray his position. Especially geared for flat terrain and hot weather, the unlined, high-grade leather keeps feet comfortable and cool. 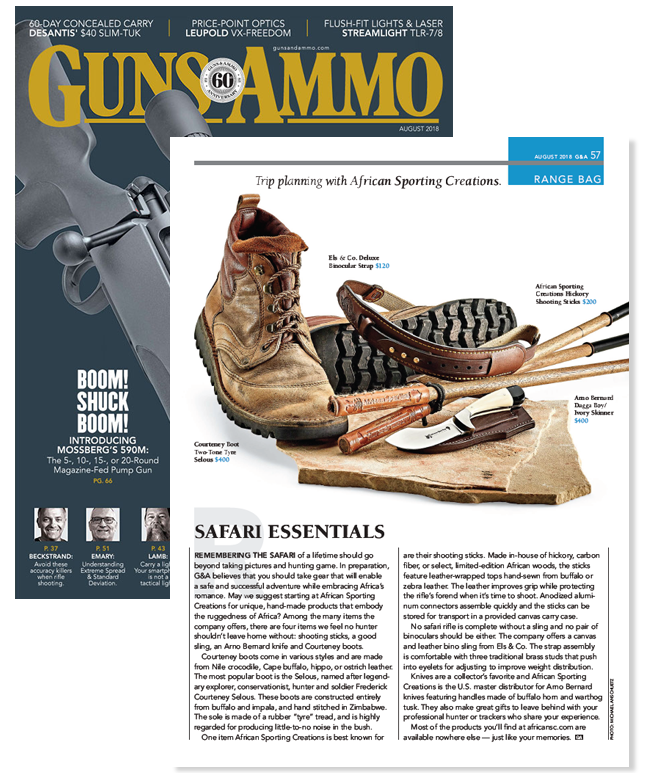 The Hunter is avail-able in the States exclusively from African Sporting Creations.